"My dad used to be so cool! I bet he had a blast!" 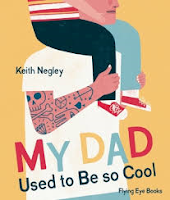 Don't we all want our kids to think we're cool? I, at times, harbor the thought that I still am. Do you? This young boy is convinced that his dad was, at one time, a music idol. When we meet him, he is folding clothes while his son sleeps peacefully close by. The son, it must be said, is pretending while taking a knowing, careful look at his dad. The evidence speaks for itself, doesn't it? There is a drum kit in the front closet, his arms are tattooed from top to bottom, a skateboard adorns one wall. The reality of his present life is shown in the laundry folding, the vacuuming, the neat office, the many things he does to make the boy's life easier and better. What happened to the hog he used to ride? When did he succumb to the lure of an SUV? The boy wonders what might have happened for his dad to have given up his rock star ways as the two head to the park for a day of play. I wonder too, don't you? I love the graphic images that juxtapose, from page to page, what Dad used to do with what he is doing now. There is evidence throughout their home that the past may have been quite different from the present. Perceptive watchers and older readers will 'get' it. Little ones will simply enjoy the chance to tease their dads about not being cool in any way at all. Remove this book's paper cover to get an early taste for how Snappsy the Alligator feels about this intrusion into his life. 'Hey! Do you mind?' he asks as we stumble upon him reading his very own book in bed. Before moving to the story, be sure to take a close look at the endpapers to see just how normal his life is. tiny, defenseless birds and soft, fuzzy bunnies." Nothing could be further from the truth and Snappsy lets the audience know that he buys FOOD at a grocery store, like everyone else. While trying to convince readers that this alligator only eats 'p' foods, a look at his grocery list proves otherwise. It continues when Snappsy returns home. His door sports a sign: No Narrators Allowed. 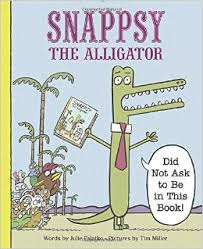 Once Snappsy goes inside, the narrator imagines what might be happening which is again far from the truth. To prove that his story is not as boring as the narrator makes it seem, we learn that Snappsy is planning a party. Party in full swing, guests arrive for a fun time, and then, a surprise guest with an ulterior motive. The alternating voices, and the varying perspective make this a wonderful book for reading aloud. It's hard to believe it is the debut work for both author and illustrator. They each do an exemplary job of creating a flawless picture book. Full of humor and warmth, with the just right amount of righteous indignation and unpredictable narration, it is a story that will be enjoyed time and time again. I can't wait to share it with a class in the fall. It has a communication device! The other aliens are coming for him! He'll have to find another way to the cadets. This new spinoff introduces Sgt. Fluffy Vandermere. He's Binky's boss and his responsibility for leading P.U.R.S.T (Pets of the Universe Ready for Space Travel) means that he keeps Earth's humans safe from alien invaders every single day. He does it with such flair. Any unsuspecting insect is fair game for annihilation! Click, his assistant, ensures that relevant facts are transmitted. Fluffy's life behind the desk has been effective, but he will admit to a touch of laziness, Fighting off an alien attack is not as easy as it once was. 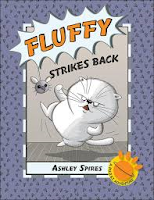 Still, when the aliens breach the base's safety net and take over, it is up to Fluffy to make the plan that will succeed in deposing the insect infiltration. From his 'secret bunker', with Click and Engineer Darryl in tow, Fluffy becomes aware that hostages have been taken and must be freed. Is it an impossible task, or can they take back their base? You will have to read this graphic novel to find out for yourselves. Terrific design, clever and witty dialogue, and expressive silliness will attract new fans and satisfy their need to return to Binky's milieu in this most welcome adventure. It's a book perfect for kids, but the adults who share it will have a great time reading it, too. Oh, and yes, there is some litterbox funny stuff! can never invite Sophie over. She would hate my dollhouse. But Sophie does come over. front of a pile of blankets ... "
I have, in my basement, a dollhouse that my brother and sister-in-law won in a raffle many years ago. They gifted it to Erin and she spent many happy hours playing with it. When she moved to Victoria, the dollhouse stayed with me. It is quite large. There will come a time when Sicily and Chelsea will play with it when they are visiting. For now, they are still too young. Matters not, it will be here when they are ready. 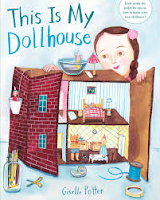 So, I feel a special affinity for this book by Giselle Potter about two girls and their very different dollhouses. We meet the narrator first and she tells us all about her house. She built it from a cardboard box; her family includes a grandma mouse, a bear daddy, and three dolls who pose as mommy and twin sisters. She explains how she has made the various accessories so important to her imaginary play. 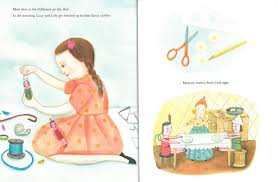 That play is reminiscent of a 'day in the life' as she shows readers what happens for her dollhouse family, from getting dressed in the morning to being tucked into bed at night. Her friend Sophie has a 'perfect' dollhouse. The family is perfect, and everything matches. There is not much going on in that house, and it is reflected in the girls' play. The narrator offers suggestion for making it more fun. Sophie is not interested. "Let's make the family go on vacation!" I suggest. "I don't have an airplane for them, so they can't," Sophie says firmly. I keep quiet in case she thinks my idea for an airplane is stupid." Fearing Sophie's disdain when the two visit at the narrator's home, the cardboard house is hidden ... until Sophie finds it and the two thoroughly enjoy an afternoon of creative play, both inside and outside. When it's time for Sophie to leave, she is not ready. They say goodbye promising to play again tomorrow, and perhaps the day after that. Ms. Potter's signature ink and watercolor artwork is full of warmth and familiarity. It is easy for young readers to become part of the story and consider the wonder for their unique ability to play and invent their own stories. Once done with the reading, remove the cover to see step-by-step instructions for making a dollhouse of your own. Get out the paints, scissors, odds and ends, and you are on your way to a day of building something that will generate endless hours of imaginary play. "Maybe if I was excellent like Elaine, Emily, Elmer, Edith, and Ernie, then I could eat at the table and ride in the van and sit on the couch and use the indoor bathroom, Ed thought. But what was Ed excellent at? Then he got it. Breaking stuff!" Why can't Ed be excellent like everyone else in his family? There are so many things he can't do that the rest of the family can. There must be something that he can do better than anyone else. Isn't there? As he watches other members of the family and tries to do what they were doing, he finds himself sorely lacking. It takes a lot of thinking before he comes up with the idea that he is excellent at breaking things. Maybe he can take his place at the table then. Wait! Just at that moment Elaine happily announces that she had broken a record for most soccer goals in a season, Ed knows he must think harder! Every single time he thinks that he has finally figured it out, another family member thwarts his success. It's tough to be normal in a family where everyone is 'excellent'. It takes time. It takes the family noticing what he is excellent at before Ed sees it for himself. As each family member speaks highly of what he does well, Ed understands why there are certain things he is not allowed to do - eat at the table, ride in the van, sit on the couch, use the indoor bathroom. Of all the things he comes to understand, only one has him stymied. You might be able to guess what it is! 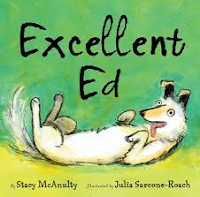 Writing this story from a dog's perspective ups the humor, and helps readers sympathize with Ed as he tries to gain self-esteem in an overachieving family. It's great fun to watch as he generates a likely explanation for all those things he is not allowed to do. Readers will appreciate the surprise ending. The illustrations are full of fun and action. They help the story move quickly forward. Front endpapers give quick glimpses of Ed as he does his very best to release himself from the restrictions a striped sweater creates to his movement. In the back, he is free and full of frolic, happily rolling and cavorting in green grass. Using acrylics, watercolor, crayon and grease pencil, Julia Sarcone-Roach creates illustrations that are lively and engaging, warm and energetic. 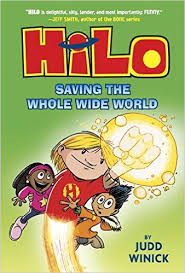 The first in the HiLo series, The Boy Who Crashed to Earth, garnered fans for Judd Winick, and a huge number of readers who have been anxiously awaiting this new volume. As with other sequels, readers hope that the new book will meet their expectations and provide as much enjoyment and wonder as the first. I did not read the first, but I know many readers who are going to be very pleased with its sequel. Daniel Jackson (D.J.) remains content to be average, despite the fact that his siblings are all much more accomplished than he is. We know him to be a friend, daring and trustworthy which is shown in the relationship he has with HiLo. HiLo is not fully aware of his many powers and has memory lapses. Trying to fit in is an almost impossible task when you are a robot boy. After their last adventure, HiLo returns to create chaos at school with D.J. and Gina as he tries to fit in with the others. It's a near impossible task. D.J. wants to keep him away from bullies and Gina concerns herself with his random actions. And that's at school. Around town portals are opening and allowing entrance to strange beings whose presence is disconcerting, to say the least. One of them, Polly, tries to help, as does D.J. 's sister, Lily. Full of action and humor, and without adult help, the kids work hard to make the monsters retreat. Razorwork, their leader, is not pleased. HiLo's encounters with Razorwork evoke visions that bring fear and sadness. Sequels can be off-putting. That is not the case here. At the same time, this second volume stands on its own as a story filled with charm, humor, action, tragedy, and some great characters. I like the way the friendship stays strong and even grows. HiLo is a genuine character whose food choices and word use make the reader stop and think. D.J. is a grand friend who supports and defends HiLo through all of their escapades. Gina keeps her cool and tries to help them do the same. Readers will love the details that the author uses to express emotions, to vary the settings, and to create unique and compelling creatures. Guy Major gives life through his vibrant colors. This is perfect fare for those kids who love graphic novels. Give it to fans, and be sure to ask if they are ready for the next one, set for release in 2017. I bet they will be! One word is all it takes ... "
Please tell me that you know Ball (HMH, 2013) by Mary Sullivan. 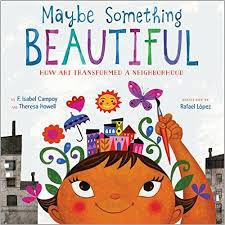 If not, get yourself to the library and check it out for your kids this summer. It is brilliant! And this is its companion - same dog, different obsession, and just as entertaining and smart. All this plump pooch is after is a treat! His nose leads him from place to place in the house on the hunt for someone to share one with him. First up is a cheerio-munching toddler. Begging doesn't work, nor do tricks to get her to share. It looks like she might share; then, she downs the last bit of cereal without remorse. Same thing happens with a hot dog lunch. Not a crumb remains when the older child leaves the table to pursue an interest in space. What about the older brother? He's willing to share his drawings and he doesn't have a treat. The fact that the dog awakens Grandma from a nap and hungrily eyes her false teeth in a glass on the nightstand, or that he disturbs Grandpa while brushing his teeth has no affect. He's off to grab the baby's bottle. Only then does he hear someone hollering TREAT and that must mean it's for him! His excitement is quashed when he sees what the toddler has gathered for his dog dish. YUK! As often happens when you don't get what you so badly want, a nap is plagued by dreams of food, food, food of all kinds, and a nightmare. Is it someone actually shouting the word 'treat' that forces him from sleep? He's off to see ... and delighted to find just exactly what he has been searching for all day long. Ahhh! There is only one word of text, but the drama is evident on every page. The expressions and body language are hilarious and will have kids chucking at the many antics he employs to satisfy his craving. find work and a way to support his daughter at home. by violence, war and danger. We don't know." Because the child is the narrator, the story is full of adventure and love and an interest in what is happening around her as they travel. She and her Papa leave with what they can carry. As they go, she counts chickens, and animals, and birds. Their journey is long, and complicated as they find ways to move from one place to another. They cross a river by raft, the countryside by rail, always accompanied by a coyote (surely a symbol of those who prey on the desperation felt by so many). With her father near, she is often oblivious to the dangers inherent in such a journey. Always she has her tiny stuffed rabbit for comfort and familiarity. They run from soldiers, and stop when Papa must work to make enough money to move forward. She makes a friend while her father works. As he says goodbye, the boy trades his two white rabbits for her small stuffed one. 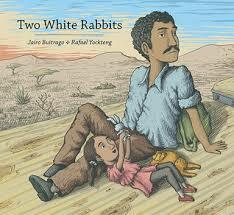 As they approach a wall in the desert, the rabbits are released and we are left to wonder how their story will end. We do not know. Perfectly conceived and beautifully illustrated, it is a story that will be interpreted in different ways depending on the age of the children listening. The digital artwork adds a poignancy that is palpable, including many details that are hinted at in the text. Every page adds to the sadness inherent in similar stories being told around the world. It should spark discussion and empathy for those whose bravery and desperation lead them to make very difficult decisions for their future. Piggie is fully aware of how lucky she is!. 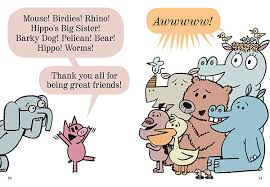 So, in this the final book in the Elephant and Piggie series, she wants to be sure to thank every single friend who has made her life so special. They are all very important to her. As he often does, Gerald tries to protect Piggie from herself by suggesting that it might be very difficult to remember EVERYONE. What if she forgets someone? Won't she feel terrible? Being Piggie, she assures Gerald he need not worry. She is about to engage in a THANK-O-RAMA and no one will be left out. Off she goes. She is a 'thanking machine'. She even remembers the flies ( you know, the ones from I Really Like Slop!). 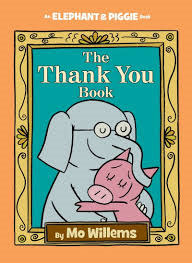 Every character from all of the first 24 books gets a nod of gratitude from said Pig. Gerald persists in his worry that someone is going to be missed ... someone VERY important. When she can't think of anyone else, Gerald is perplexed and angry. A goof needs to be amended. Piggie heaps profuse thanks on her best buddy. While he appreciates her gratitude, he tells her that he is not the one she should thank. "WHO DID I FORGET TO THANK!?!" she screeches. Gerald quietly reminds his best friend about the loyal readers who have been part of their journey. "Thank you for being our reader! We could not be "us" without you. And you heard it here ... not for the first time. The best $250 you could ever spend would get you this incredible library for your kids, or for a newborn's shower! Get your friends together and give the gift of a lifetime! 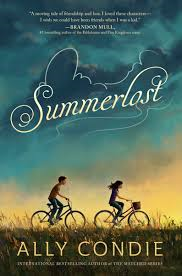 In a book about moving that takes the perspective of the best friend left behind, we meet Nico and Maia. They do everything together ... until, they don't. Nico's is moving far away with his family and Maia is left to miss him, and to find new meaning in her days. She is very lonely, but she just can't make time for anything but her longing for Nico. follows Maia everywhere she goes. As happens, her feelings of loneliness ease. A kitten helps, and so does concentrating on piano lessons. At school, she meets a new friend who shares her interests. She and Nico talk on the phone and share news. When spring arrives, Maia no longer has to count the days until her best friend is back. That day arrives ... and with it, a niggling worry that things may have changed between them. A lot has happened since they have been apart. She need not have worried at all. The hole that was left in her heart with Nico's departure is filled once more. There is so much emotion involved when best friends part. Those feelings are carefully shared in this lovely, quiet story from Mexico. 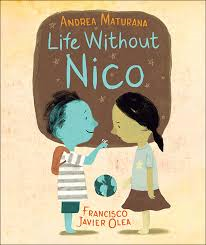 The illustrations perfectly match the story's tone, with shadows portraying the emptiness that Maia feels while Nico is gone. There is also light within those shadows, and bold and beautiful color to herald his return. Lovely, and sure to inspire conversation. "It's amazing what experiments you can carry out with everyday items like paper, rubber bands, and balloons. As you'll see in this exciting chapter, you don't need any special materials to understand the structure of DNA or to find out about the planets in our solar system. There are also experiments with paper planes and static electricity." Oh, boy! You are going to love this book ... if you love science, and you have an interest in building, inventing, creating, discovering. It's all here for you, and the instructions make it easy for you to try your hand at projects in the kitchen, around the house, in the water, and in the great outdoors. Each chapter starts with an introduction similar to the one quoted above. Each project is described in pages of information, instruction, and explanation for how and why it works, often including a connection to Real World Science. "Like whisked egg whites, snow contains lots of trapped air, and is a very good insulator. That's why people can stay warm in an igloo, a shelter made from bricks of snow and traditionally built by communities living in northern Canada and Greenland." Jack Challoner happily shares his knowledge of science through talks and demonstrations in schools, libraries and museums. And now, in this wonderful new book from DK. He is happy to report that he has tried each one of the projects shared here. Most materials are readily available in the home and all help to explain scientific ideas. Kids learn best when actively involved in their own learning. 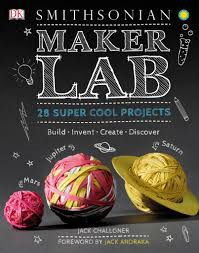 In trying these fun projects they may fail and have to make another attempt. That just makes the real learning better and much more memorable for them. There are more than twenty-five experiments to try, some much more difficult than others. All can be accomplished with perseverance and perhaps a bit of help. The instructions are very clear, the photos beautiful and extremely useful, and the science evident. "Leave your glass for several days in a safe place. Check each day to see how the sugar crystals are growing. If a sugar crust grows on top of the solution, gently break this and remove it - this will help the lollipop to continue growing." And now I know how hoarfrost forms! "The disappearing chicken laid an egg this morning! I could tell it wasn't Henrietta's because it wasn't glass; it was like a fancy organic brown egg that rich people buy at the store. I took it out of the nest box really carefully and put it in the fridge like Agnes said to, even though I could hardly wait to scramble it and eat it for breakfast." Sophie Brown and her family have inherited a farm from their Great-Uncle Jim. Her dad no longer has a job, her mother works from home. The farm seems the perfect place to start anew. It is a rude awakening for the young girl, but she will make the best of it. Finding a flyer that offers unusual chickens for sale is enough to stir Sophie's interest and have her start a letter writing exchange with the people at Redwood Farm Supply - well, not an exchange until she receives a letter from Agnes who is using a broken typewriter and offering cryptic advice to be careful about the first unusual chicken Sophie has encountered. Agnes is quite sure it belonged to Uncle Jim, and its existence should be kept a secret. Sophie replies to that first note from Agnes with a number of observations and some pertinent questions. Turns out that Henrietta is a Bantam White Leghorn, and she is definitely unusual. Sophie is aghast when someone tries to steal her pet chicken and she lets Agnes know about it. She is sure that Agnes will offer advice. In the meantime we are learning the rest of Sophie's story through her letters to her beloved and deceased grandmother. She addresses them to Mariposa Garcia Gonzalez in a variety of different locations: Heaven, A Better Place than this Farm, Somewhere Gregory can't deliver the mail to, Somewhere wonderful, I hope. These letters keep Abuelita up on the goings on at the farm ... all of them! "I wish I'd asked you about your chickens while you were alive. What kind did you have when you were a girl, before you came to this country? Did you name them, or just eat them? I know you had to be practical and use what you had. But if you're still keeping an eye on me, would you please keep an eye on my chickens too? They aren't very good at keeping quiet yet." "You could build just about anything out of all that junk. If you had enough time and imagination (and could remember which pile the thing you needed was in). I guess that's why you saved it. Henrietta follows me around as I carry things from pile to pile, doing that very quiet cluck, and turning her head to look at everything. She loves it when there's a bug under a piece of junk - she pounces on it and gobbles it right up." The chickens that Sophie becomes mother hen and caregiver to are a motley and talented bunch - and someone else wants them. It is a test of her endurance to keep them safe, with help from Agnes and Gregory, the mail carrier who also knows their secrets. There are so many wonderful and humorous surprises in this book! 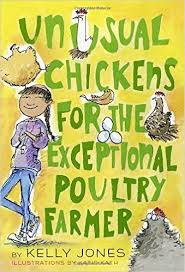 Readers learn a great deal about the chickens themselves - how to raise them, their many varied characteristics, housing for them. Katie Kath's terrific illustrations match the tone at every turn. There is so much personality on every page. They are serious when Kelly Jones shares information, hilarious when introducing the unusual birds themselves, and warm-hearted when Sophie speaks to or sends letters to those she loves. You will root for Sophie from start to finish. It's tough to be the new kid in town, and she works hard to prove herself trustworthy and honest, despite the fact that 'one of their own' wants Uncle Jim's chickens for herself and will go to any lengths to get them. Life on the farm may not have been her first choice; Sophie makes the absolute best of it! 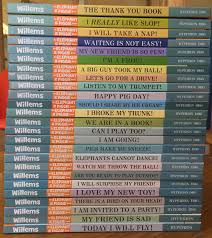 Emotional, often hilarious, and very charming, your kids deserve to hear her story. Her sharp eyes spy Rabbit. I read this book a few weeks ago, and it came quickly to mind on my last trip to Winnipeg. As I was driving home, I chanced to see a coyote on the side of the highway. They often look slim and hungry to me; I wondered if it might be a mother searching for food for her young family. That happened only because this book has remained very clear in my mind. It is quite lovely, with its focus on the hunter. She prowls through city streets in search of whatever sustenance she can find. The senses are stressed as she searches: listening, sniffling, always peering into the darkness. The sentences are short, taking up little space on the dark pages. She uses her acute hearing to listen for small sounds; then, her keen sight and agility to POUNCE on any prey at hand. She lurks in nearby bushes to ensure a surprise attack. skittering under the slide to safety." Light returns. Will Coyote finally experience success on this night full of near misses? 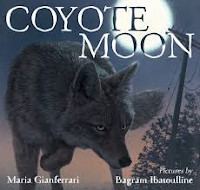 Bagram Ibatoulline matches the tension of the hunt in his dark, shadowed paintings while also allowing readers just enough light to see each distinct detail of coyote's body - foot pads, pointed toenails, sharp teeth, lush fur. He changes perspective often, allowing the reader to feel a part of the hunt itself. His Coyote is as real as can be (often maligned as an animal to fear and hunt), yet sympathetic to those who read this story of a mother intent on finding the food needed to provide for her young. The break of day is breathtaking! "Coyotes are thriving because they have been able to adapt to their surroundings. They aren't picky eaters; they're opportunistic. That means they eat what's available. Eighty percent of the coyote's diet includes rabbits as well as rodents such as mice, rats, and voles, but they also eat other kinds of food, depending on their habitat and the season." There is much more, including a list for other reading and websites which will further inform. "I went back to my homework, though I found it hard to concentrate after what she'd said. I wasn't loser bait. I just wasn't like her. I didn't want new friends. I wanted to ride the bus with Shani and have sleepovers on the weekends. I wanted to fall asleep in my own room at night, and wake up in my own house and eat pancakes on the back porch. Just because New York was new didn't make it better." Val, Thyme's little brother, was diagnosed with cancer nine months ago. In an effort to keep the cancer at bay, the family decides to make the move from San Diego to New York where Val has been accepted into a new drug trial. Of course, they move. Thyme is our narrator. Through her strong voice, we learn a lot about the impact that illness has on a family who will do anything to chance a better outcome for Val. She voices no complaints, although she does miss her home, her grandmother, her best friend. She knows the move is only temporary. Or is it? Her love for Val far outweighs the longing she feels for her old life. When the treatment shows promise and her dad accepts a new job in the city, the future becomes less clear. Thyme is pleased that Val is improving, but finds that hard to reconcile with her wish to be back where everything is familiar and normal. Melanie Conklin does an exceptional job of voicing the conflict that Thyme and her sister Cori are feeling, all without ever letting go of the love and full support they give their little brother. It's tough on families living with grave illness. Ms. Conklin expertly draws the reader in as she shows just exactly how the entire family reacts to their new reality. Not once did I feel pity; she never allows for that. I admired the positive energy that came from each family member, so eloquently voiced by the parents and felt by Thyme and Cori as they support Val through the ups and downs of the treatment and its aftermath. My heart broke as I turned page after page, wanting only to share their challenges. The book is written with humor (thankfully) and great compassion. 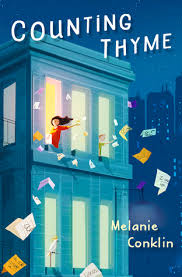 Though Thyme is steadfast in her belief that the family will return to San Diego, and her need to remain loyal to her best friend there, she finds herself slowly getting involved at school and making new connections, especially with Jake who has experienced grief as she has. Her uncertainty concerning her place at the heart of the family is quickly forgotten when a medical crisis arises. Family is family, all working together with hope, with strength, with love most of all. You won't soon forget Thyme and those who love her. "The crew were delighted to have a new passenger. There were already a few animals on board, to provide everyone with milk, eggs, and companionship. Clara gave everyone she liked a lick. Her tongue was as soft as velvet. 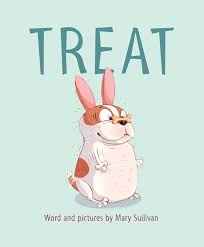 She ate ... "
The entire title of this enjoyable animal tale is Clara: The (Mostly) True Story of the Rhinoceros Who Dazzled Kings, Inspired Artists, and Won the Hearts of Everyone ... While She Ate Her Way Up and Down a Continent!" I think I made the right decision to put it here at the beginning rather than at the title of this post! It is a great description for this new book written by the prolific and always thoughtful Emily Arnold McCully. Reading two books about the ethical treatments of animals (Clara's Grand Tour, Ridley and Nim Chimpsky: The Chimp Who Would Be Human, Hess) led her to want to share Clara's story with her readers. Those children who love animals will admire the storytelling, and want to tell their friends about it. It happened almost three hundred years ago. Clara was much admired by the many who saw her as she travelled with her caregiver, Captain Douwe Mout van der Meer. The captain had a genuine interest in sharing Clara with an audience and spending his days with her. It was not an easy task to trek from place to place with a growing rhinoceros. She ate more than 100 pounds of food and gained 20 pounds each and every day. Think of the carriers needed to move such an ever-changing animal from one place to another! Yet, they did it. The captain was willing to do anything for her, and Clara seemed to return the love he showed her. At a time when a rhinoceros was thought to be 'monstrous' and 'frightful', Clara was living proof that it was not the case. 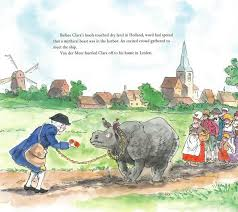 Few people had even seen a rhinoceros in the mid-eighteenth century. Royalty was as entranced with seeing Clara as were their loyal subjects. For seventeen years the people of Europe were thrilled to have the chance to get up close to her. Clara seemed equally happy to let them. Painters wanted to paint her, the navy named a ship after her, and people came in large numbers to see her at every stop on the tour. included in back matter and on the endpapers. This is most enjoyable reading for many, and is sure to be a hit with young listeners. 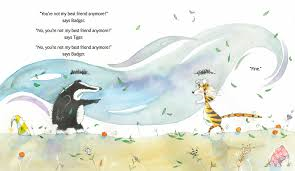 "Tiger puts on Badger's hat. He sits in Badger's chair. 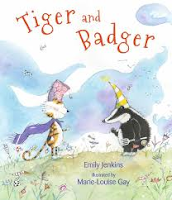 Tiger and Badger spend their day as so many children of their age and ilk spend theirs. They may be best friends, but that friendship is fraught with all of the emotional and personal encounters that are part of a young child's life. Some days they cannot even agree on who is who's best friend. Have you been there? Today's seemingly endless conflicts begin with Tiger wearing Badger's hat, sitting on Badger's chair and eating Badger's orange slices. Badger is rightfully indignant. After all, he had been sitting there - at one time, at least. Tiger will not be dislodged until Badger distracts him with Bad Monkey. Badger resumes place of pride on the chair, eats a couple of orange slices and then makes a peace offering to his friend. All is well until there is only one ice pop, and sharing is not an option. A fight ensues; Badger wins; Tiger is unhappy once more - and throws Bad Monkey into a nearby tree. It takes two and cooperation to extract the monkey. All is well, or is it? The arguing and discontent is not yet ended, as you well know if you live with a preschooler. A rift, and a separation ... all accomplished without trite apology or adult interference ... eventually leads to funny faces and a warm hug. All is well, for as long as it lasts! Two of my favorite artists together on the pages of one book. How lucky am I to share it with you? Emily Jenkins has the language down pat, with back-and-forth dialogue that convincingly captures many of the conversations I have heard with kindergarteners. Left to their own devices, they will soon sort out their differences (often more difficult for girls than boys - but that seems to continue into adulthood) and move forward, as happens here. She has her finger on the pulse of the young child and pens a story that is a delight to share! Marie-Louise Gay uses her signature watercolor washes, acrylic paints and pencils to create warm, detailed backgrounds for her expressive characters. The hills, trees, and sun-filled skies provide a backdrop that is as comfortable as their friendship. Constant movement is shown with lively, flowing lines. I love the little black clouds that hang over their heads to help them express both anger and sadness! Two words seem totally inadequate to express my gratitude to the readers of this blog since I began writing it on November 11, 2009. Today I post my 3,000th book and welcome the 300,000th visit from loyal readers. I want to acknowledge your dedication to children's literature and the importance your give to sharing books with the children in your lives. I trust that you have found books to love yourselves, as I have surely done. I am blessed to have the time, the energy and the need to get these wonderful books into your hearts and hands, so that you can help kids find the 'just right' book when they need it the most. I will carry on, knowing that you are reading and hopefully finding books that you want to have in your classrooms, your libraries, your homes. Thank you for your support, your encouragement, your attention to what matters for our children - literacy for a lifetime! A special thanks to my dear friend Ingrid who insisted that I write a blog, and did all the work to help me get started! just before the ship is ... "
Here's another book about weather - and too much rain! We know that feeling, at the moment. Anxious looks at a darkening sky, hurried preparations for a forecasted storm, and a promise likely to be broken are the premise for this journey of the imagination. 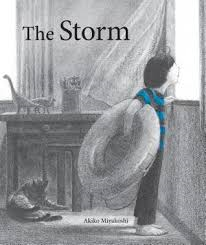 A highly anticipated weekend trip to the beach seems destined for another time as the child wanting to go watches the storm bear down upon his community. beats hard against the shutters. The wind howls and blows. I try not to be scared." 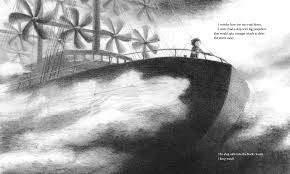 A warm bed, a sound-muffling blanket over his head, and relaxation result in a dream of sailing in a enormous ship that has the power to allay the rain and wind. What will the morning bring? The impact of the powerful charcoal drawings cannot be overstated. They evoke the dark danger of the approaching storm as well as the fear and hurt it causes for the young child who wants no part of it. He wants to go to the beach, as promised. The dream sequence has such force and fantastic strength with its wild wind and threatening skies. The child has control of the ship, and the danger passes. As it lifts to the lightening skies, we know that the storm has diminished. What adventure it provides! The only color in the book is given to the bright blue sky of morning, and prompts the welcome trip to the beach. If there's a rainy day in your future, this would be the perfect book to take off the shelf and share. You know that I have a love for wordless books! 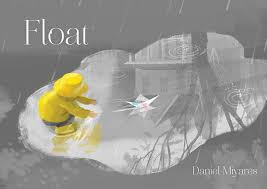 Given how much rain we have had on the Canadian prairies lately, Float is a perfect story to share with kids who have been dealing with too much time spent inside, and not enough outside delighting in puddle pleasure. Lucky little guy whose dad folds a boat out of a sheet of newspaper, then allows him the joyous freedom of being out in the rain! As the rain pours down, he protects his boat by tucking it under his slicker. When the downpour lessens, he is off to try his hand at sailing that boat in nearby puddles ... and splashing, leaping, pouncing through the accumulated moisture. Placing his boat in a quick moving water stream, he chases after it. It is tough work to keep up; he makes a stop when he needs to check for traffic. By the time he catches up, the boat heads straight for a drainage pipe, washes through and comes out ruined. Downhearted, he returns home - soggy piece of newspaper in hand. Dad provides a warm hug, clean and dry clothes, and a hair dryer. After a shared hot chocolate, Dad sets himself to work with another sheet of newspaper. Just as the original sheet had a picture of a sailboat, this one sports a jet. Another brilliant creation, a clear and sunny sky - there's a brand new adventure to be had. 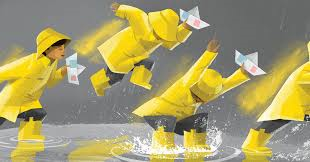 Daniel Miyares' digital artwork is brilliantly presented in drab grays with bold splashes of bright yellow. This book is filled with the joy of simple things, and is a fine story told beautifully without the benefit of text. Everyone can read this book, bringing their own interpretation to it. Perfect for all young listeners, whether they can read or not; it has no language barrier. The pace changes, the perspectives shift, and then returns to quiet comfort. Endpapers show the explicit paper-folding techniques needed to make both. Save those newspapers, and prepare for the play that is work for your little ones! "We didn't deal with skiing last winter. My mom didn't get out the ski rack or the skis. She wasn't as good as my dad, and driving in the snow scared her, even though she was the one who had lived in it all her life and my dad was from Portland, where it didn't snow nearly as much. We didn't even talk about going skiing. And I wasn't mad. I didn't want to go either. Maybe Miles did, but if so, he didn't say. " I have been reading a lot of middle grade fiction in recent weeks ... lucky me! There are a bunch of wonderful books available, written by accomplished and incredibly thoughtful writers. Ally Condie is one of them. In her new novel, she introduces us to Cedar Lee whose mother has returned with the family to Iron Creek, Utah where she grew up. They will be there for the summer, and Cedar's mother is working hard to make their new house a lovely summer retreat. A retreat is much needed as they are all still reeling follwoing the accident that killed Cedar's father and brother Ben one year ago. As she sits contemplating this new reality, Cedar notices a costumed boy riding past on his bike. She is intrigued. It doesn't take long to make his acquaintance. Leo helps Cedar find a job at the town's summer Shakespearean festival, called Summerlost. The two work at selling concessions there. Because Leo is an enterprising sort and needs to make enough money to travel to England with his father, they are soon leading unofficial walking tours that focus on Lisette Chamberlain. Lisette was a homegrown actress who died suddenly years ago. The two think that they might find clues that will lead to understanding the mystery that surrounds her early death. "It's not only the hard stuff I remember about Ben. I remember his ruffly hair, how he screamed but sometimes laughed. I remember his eyes wild and also very, very deep. I remember him when he was a baby and a toddler and he was cute and funny and none of us, including Ben, had any idea how things were going to turn out. And how he started to talk again that last year and liked me to hold his hand when we watched scary parts in movies. He'd let go right when the scary part was over but when it was happening he held on tight. I loved him. I finally loved him again, and then he was gone." Her voice is honest, reflective, often sad and tender; all the while it is a realistic depiction of what happens as families deal with the reality of moving on from something life-changing. She finds needed strength in her friendship with Leo. Leo is very much in need of a friend as well. Bullying plays a quiet role in helping us see how uncertain life can be, and how vulnerable we are. "My dad used to say that life was like turning the pages in a book. "Oh, look," he’d say, pretending to flip the pages in the air after we’d had something bad happen to us. "Bad luck here on page ninety-seven. And on ninety-eight. But something good here on ninety-nine! All you had to do was keep reading! ” ... Of course he never slammed the book shut, which was what happened to him. One last bad thing and then the end for him and for Ben. No more pages to turn, nothing to get them to a better part of the story." Hopeful in the end, and filled with loving memories that help the healing. This book deserves your attention. the string of a kite." Despite the gray that surrounds her, Mira has an eye for the beauty that art can bring to her neighborhood and the people who live there. Mira loves to 'doodle, draw, color and paint.' She happily shares her creations with those she meets, and even tapes her artistic creations to the nearby drab walls. It helps, but not much! When she meets a man with a pocketful of paintbrushes she is inquisitive, asking what he sees in these surroundings. He answers, then shows her just exactly what a mural is. Mira is eager to give assistance. Mira added color, punch and pizzazz!" It isn't long until everyone is involved, adding music to the mix and a tremendous amount of enthusiasm for the art that so enhances their community and the way they feel about it. In a note from the authors they share that their book is based on a true story. "At one time, the colorful East Village near downtown San Diego, California, did not have murals on the walls, nor quotes from Gandhi, Martin Luther King, and Cesar Chavez written on the sidewalks. Benches were not the works of art you can see now, and people living in the area were not part of the vibrant community that they are today." Rafael Lopez and his wife Candace made the plan, hosting meetings to share ideas and inviting all who would benefit from change in their community. The results of their hard work inspired other communities around the world to do the same. It is fitting that the astonishing illustrations, created with 'a combination of acrylic on wood, original photography, and digital art' are the work of that same Rafael Lopez. I love the curved lines, the lovely splashes of beautiful, bright color, and the way the book moves from horizontal to vertical! It is as vibrant as I imagine the East Village must be. The human spirit is alive and well on each of its marvellous pages - glowing and proud. ... or in the summer." 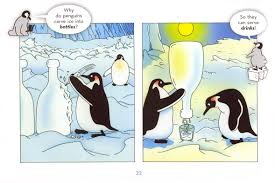 In goofy graphics, the author proposes questions about penguins in hopes that we will learn a great deal about them. What happens, in fact, is that we get even goofier answers than the posed questions themselves. "Why is it so cold at the South Pole? To make penguins stick together!" The two part illustrations show penguins scattered all around the ice in the first, while the second shows them huddled together as we so often see them. The sight gags shown on every page will have readers hooting at their antics. The penguins wear mittens, stand in front of heaters that melt the snow and result in their falling into ice holes, stand on the ice rather than lie down in a snowstorm to keep the snow solely on their heads, rather than accumulating on their entire body, check directional markers so that they know they have finally found the South Pole ... the goofiness just amps up! After convincing ourselves that we now know nothing important about these tuxedoed inhabitants of cold southern climes, the writers provide AMAZING BUT TRUE: 100% GENUINE, REAL FACTS ABOUT PENGUINS! in back matter, as well a list of further resources. "Why do penguins carve ice into bottles? So they can serve drinks!" or bounce like a pea." and it's never too young to start. So start with Colin and Lee. There is nothing about each that is the same as the other ... wrong again! They are the very best of friends. 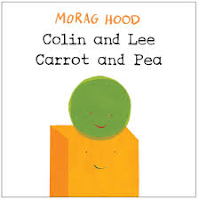 It matters not to Lee that almost every one of his other friends is a pea. Colin is not; it does not change how he feels about him one bit. Of course, there are differences. After all, Colin is a carrot. He can't do all the things that Lee can do. He can do many things that Lee cannot. Isn't that the best kind of friendship to have? Each brings their best self to the relationship and to the things they can do together. Evident is its simplicity; this book has a lovely, quiet message to share. The only colors are green and orange. The white background space keep our attention clearly on the characters. Reading it makes it so easy for little ones to comprehend that friendship is what matters, and we all play a part in the activities we share. 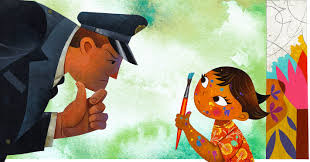 Let's teach kids and others to celebrate our differences! "When night falls, the barn owl awakens and hunts for its favorite meal: shrews and field mice. Its pair of extraordinary eyes and its impressive hearing help it hunt in the deep black night. This is how it can see the slightest of movements made by a mouse on the ground even under a thick layer of snow. When two barn owls find one another, they stay together ..."
This is a book that is sure to hold my attention again and again. It sits on my coffee table, and is likely to be there for months. It is absolutely compelling for the images that adorn each of its pages. Beautifully designed and illustrated, it is an introduction to many animals, all native to the northern part of our world. It is divided into three sections: North America, Europe, and Asia. The continents offer up an endless array of animals; feathered and furry, land animals and those that live in the water, large and small. They are extremely diverse and we learn more about them as we pore over the pages. As we go, we also learn something about the geography of the three regions and how that helps determine the animals that are indigenous to each. You will be astounded by their beauty and their variety, by the expression and movement that is shown with stunning clarity in Mr. Braun's depictions of their grace and appeal. The double page spreads show one close-up depiction and one that indicates their habitat. Many (but not all) have descriptive paragraphs with pertinent information. All have the Latin name shown alongside the familiar name. You will recognize some, not others. Many are endangered already, or threatened with extinction. Every reader is sure to be interested in each of the pages for its sleek forms and earth-toned images. I would love to have one (or more) on the wall in my house. Your family and guests will spend countless hours poring over the pages, and learning about animals of the northern hemisphere. Point of interest: this is the first book. The next, which will soon be published in English, introduces the animals of the Southern Hemisphere: South America, Africa, and Australia. Can't wait to see it, too. An index, with a further illustration of each, will be helpful and repeats both common and Latin name. Native to the northern polar region, polar bears are the largest land-dwelling carnivores in the world. They are also in their element in the water as they are excellent long distance swimmers and can travel five kilometres an hour, but prefer to hunt their prey on land. Different kinds of seals and young or weakened walruses should be wary when the 'white giant' is hungry. Incidentally, its coat is not strictly speaking white: it only appears that way because of the reflection of the sun. The hairs of its outer coat are usually hollow and translucent and the skin underneath is black." Pete undertook a ... "
Pete is a neatnik! He loves order in everything he does and sees. Can it be a problem, do you think? I think that is likely true for those who know him, and for Pete himself. There is nothing that escapes Pete's watchful eye ... from those flowers that don't match the patch, to the knots and twigs in fox's fur, to the falling leaves and bare trees. Poor Pete! His work never ends. He is very good at his job. Kids will love watching Pete as he goes about his business, and the methods that he uses to neaten everything up. 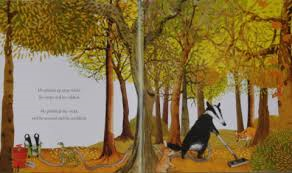 They'll have a hoot at his solution to bare trees - just dig them up! But, wait! What else is happening? Pete is sure that he has the acceptable solution. Now, the forest is looks just right! Only then, does Pete discover the interconnections in nature. One thing out of place and all are affected. 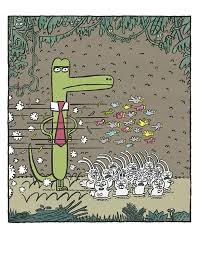 This eco-friendly tale teaches its lesson without any hoopla, or unnecessary word. 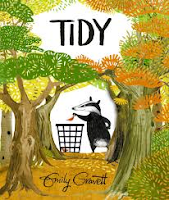 Emily Gravett's perfect and gentle message will not be lost on the children who share this book; yet, they won't even realize that each time it is read (and it will be read often) they are learning about loss of habitat, the importance of protecting natural spaces, and community building. Check every page carefully for humor, expression, and wonder. Share it often and out loud to hear the pleasing rhymes, to talk about the shared learning and to enjoy another brilliant book from this talented and thoughtful artist. If you're a fan already, you are sure to recognize some of your favorite animal characters! Alphabet books are so hard to present without describing every clever way an artist shows meaning. In Isol's beautifully crafted book about the letters that make up our words and stories, she shares her distinct artistic vision on pages that help us see them in a very unique and bold way. Let's start, at least, with A! An enraged dog is furiously barking at an in-flight bird; the words are: That's not an answer. Readers are invited to determine what the story might be, allowing for many personal interpretations of just one double page spread. Nothing prepares the reader for what comes next. Paging through we find that each of the images is created with complexity and offer an opportunity for close consideration of the author's meaning. Every page requires food for thought and individual interpretation. Every time I read it, I choose a new favorite image, and word or phrase. "O ... You are such an optimist" shows two black birds sitting on a tree branch, one warbling a carefree tune while the other sits miserably on the branch uttering its complaint. "N ... A nightmare" shows a child in a red animal masked hood and matching coat being stalked by another animal. What might those animals be? It is left to us to decide for ourselves. Always thought-provoking, often unusual and mysterious, some readers will feel uncomfortable when explaining their own perception of the artwork. I suspect they will be the older readers, and even adults. Children will find the pages entertaining and worthy of their attention, and of their opinion. What an invitation to storytelling it provides! A Moroccan desert spider "flic-flacs" - turns flips across the sand dunes - to escape predators. For most animals, turning end over end is not an efficient way to get around. But for some creatures ... "
So, how do living creatures get around? If you have ever asked yourself that question, you are thinking in similar ways to Steve Jenkins and his wife Robin Page. I know they do a lot of thinking about things scientific and fascinating. We are so lucky that they do, as their wonderings continue to result in terrific books of nonfiction that are eagerly shared with kids. 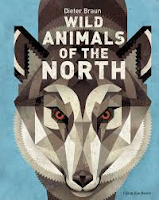 In their newest book they again turn the spotlight on a wide variety of animals. Some you will quickly recognize, others may be new to you. 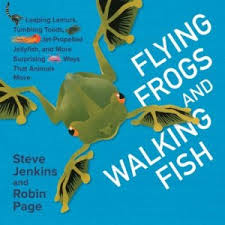 In each section they discuss the particular way that a group of specific animals moves from one place to another - walk, leap, swim, climb, fly and a host of other variations. The first section is the walking one. On the first spread we learn that the common octopus walks along the sea floor (I knew that!). 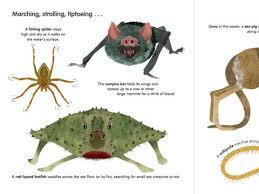 On the second spread we learn about animals that tiptoe, stroll, waddle, and march. Each new section consists of two double page spreads, one introducing and one expanding the variety of animals who move in such a way. As always, the art focuses on the animals. Torn and cut-paper collage is a brilliant medium to show each one clearly. 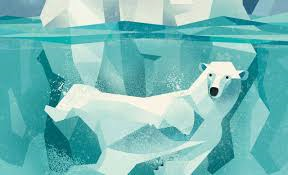 Earthy tones and expanses of white space allow young readers to see the many details of the animal itself and get a strong notion for the way its body gets from one place to another. The names are presented in bold font, and captions provide a brief explanation for their movements. I love the use of verbs for describing those many movements. Adding further facts following the main text is trademark to this team's collaborations and make their books even more appealing. They include a bibliography to show young writers how important it is to do research when wanting to write factual text. Diversity in the creatures presented helps to distinguish the Jenkins-Page books from other exemplary nonfiction - kids love them and are delighted with how much they learn when reading and sharing them. Have big noises inside them. Not just any corn will pop. is very hard ... "
Sharing this book puts kids in the know about five food groups ... fruits, proteins, vegetables, grains and dairy. The added bonus is that they discover that by eating foods from each of the mentioned groups, they will put themselves on track to a healthier way of living. Each of the groups is introduced in a haiku, followed by three double-page spreads that help readers learn a good deal about the foods that are part of the named category. The questions asked for fruits are: What is a fruit?, What makes fruits sweet?, and finally, Why Are Fruits Colorful? A descriptive haiku has a place on each spread, and the facing informative paragraphs that answer the questions are accompanied by colorful acrylic illustrations that show five children visiting a local farm and learning what they need to know from the farmer who accompanies them on their visit. There is much to learn, and it is presented in a format that children will find enjoyable and helpful when learning about good nutrition. 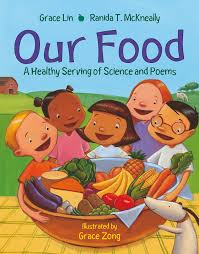 Good for all families and welcome in classrooms where you are planning a study of nutrition and healthy eating. A glossary is also helpful. 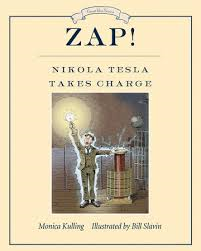 "Nikola Tesla stepped forward and cleared this throat. "Can I help you, mister?" asked Edison, rumpled and frustrated. Tesla gave Edison the letter from his boss in Paris. It began, "My dear Edison, I know two great men and you are one of them. The other is this young man!" Edison sent Tesla to fix the SS Oregon's dynamo. The young man worked all day ... "
In this ninth book from the wonderful Great Idea Series we learn about a man who as a child proved to be quite brilliant. His memory inspired awe in others. By the time he was ten he knew six languages. And, he had dreams. Before reaching his 30th birthday he took an ocean liner from Europe to New York City. All that he had with him by the time he arrived were 'four cents, a book of poems, a drawing of a flying machine, and a letter of introduction to Thomas Edison". It was not an auspicious beginning. Nor was his meeting with Mr. Edison. The two men were very different and did not share the same scientific beliefs, despite their shared interest in and knowledge of electricity. After being cheated out of a promised payment for work done, Niko left his job with Edison, found a new mentor in George Westinghouse, and a chance to test his personal theory concerning alternating current. Success brought further chances to prove himself; he built the first hydroelectric plant at Niagara Falls, and followed that with many other projects. This fine series focuses on inventors who are not always well-known to the target audience. Monica Kulling writes with clarity, assuring that her young readers get to know the man who accomplished so much. She explains the difference between direct and alternating current in language that I understand (I sadly lack a single science gene). Tesla had an uphill battle against the popular Edison, and the two would work diligently to each prove the other wrong. The World's Fair in Chicago was the catalyst for 'electrifying' America, thanks to Tesla's more efficient delivery of power. In front matter, the author includes her sources of inspiration for her writing, a list of websites meant to encourage and inform those wanting to know even more, and a poem about Niko as a child. 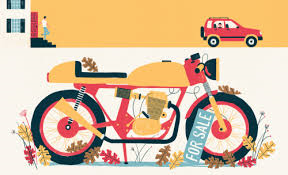 Bill Slavin created his illustrations with pen and ink on paper that was then digitally colored. His images perfectly match the tone and impact of the text. He proves an adept researcher as his drawings distinctly reveal the historical time period, as well as the main characters themselves. This is a terrific addition to the series.